food we love to cook, eat and share. At the beginning of January I had to attend a week long uni course for a paper studying the creative process. Long days, 13, 15, 18 hours for some groups, in small rooms on hot afternoons. We had spent hours in the weeks leading up to the course thinking on our own creative process; what drives us, our passions, our forms of expression and our greatest influences. During the course we talked with our group, our lecturers and with complete strangers about our crossroads in our lives, our battles with our past or our present. People were desperate for tragedy, for drama, and for darkness; any of my contributions to these discussions were said to be on the lighter side and for that I was made to feel I should apologise. When most conversations centred on the dark and twisted side of our lives – broken marriages and families, mental illness, lost love ones, destructive relationships – you can imagine I left the subject of food; how we eat, how we grow, how we buy, well alone during that week. What is important to me, what I am passionate about may have raised a few eyebrows, if not elicited a few indignant snorts. But, really, barely a day goes by when I don’t think about what we eat, how we produce and consume food, and how can I, a student in this strange limbo place between university and the ‘real’ world make better, cleaner, fairer food decisions. This is why I’ve been quiet here recently; I’m figuring out how best to do this, this business of eating. I would like to make radical decisions like completely rid my pantry of white flour and white sugar. I would love to have a no-supermarket policy, except for non-food items. I would like to source some of my food directly from the producer, especially dairy products; raw milk, yoghurt and cheese brought from the farm gate or the farmer at the market. But, like so many things in life, we need to find our own style here – like choosing a car, or building a house, a career, a life with someone; change and decision influenced by personal style. I’m loathe to use this term after my week long uni course, but perhaps I’m at a food crossroads. So, I start small, the very essence of think global, act local. I love the Sunday farmers’ market for its vibrancy and diversity. There is always a sense of anticipation before going to the market and the often chaotic atmosphere requires focus and a clear head. The market is an affront to the senses but this is preferable to the sterile aisles of a supermarket. I have always loved Moore Wilson’s Fresh for the smell – bottled market place, we’ll call it. But Commonsense Organics, right next door to Big Bad Wolf, is a new favourite place of mine. There is a feel-good factor to shopping here, even if my purchase is simply a couple of apples or the Little Bird macaroons sold at the front counter in glass jars. 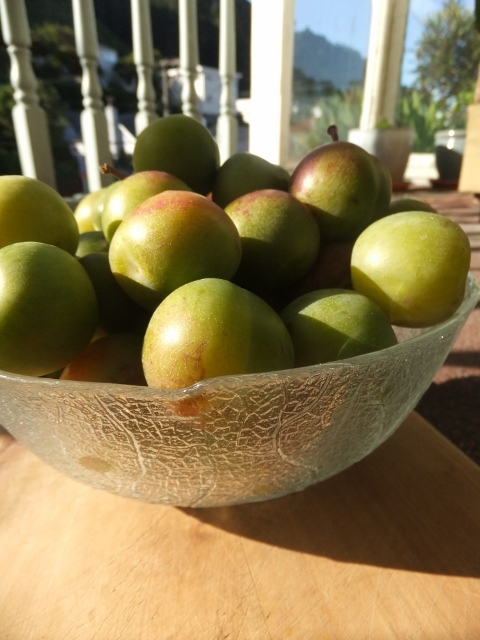 There are often specials, show casing the very best of the seasonal produce, which is how I came by a kilo of New Zealand greengage plums. 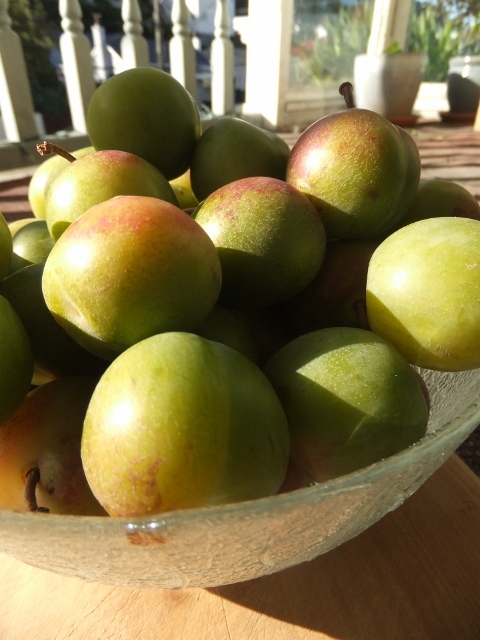 Google delivered entire articles on the magic of the greengage. This notoriously fickle fruit appears to have a somewhat cult following amongst plum lovers. Their green skins, perhaps with a purple blush across the shoulders, yields to a nectar-like, honey yellow flesh within. I popped a few in my mouth, and felt the skins pull and pucker as the fruit burst and I could taste fragrant honey dew melon then the skin was a slight citric tang at the end. I roasted most of the kilo, and I think this is the way to go. Their best properties – colour, tang and texture – are given the room to shine. Roasted simply with only butter, honey and the juice from one orange, this is one of those dishes where the whole is greater than the sum of all parts. Butter acts as the base on which sits the sweetness of the honey, then the citrus of the orange hops on board, while the greengages, collapsed and juicy, deliver a fragrant sweetness so typical of stone fruit. Right at the end of a spoonful, just shy of getting caught in your throat, these plums give a shout, a rather tart shout to remind us what we miss come mid-winter – the delightful balance of sharp and sweet. 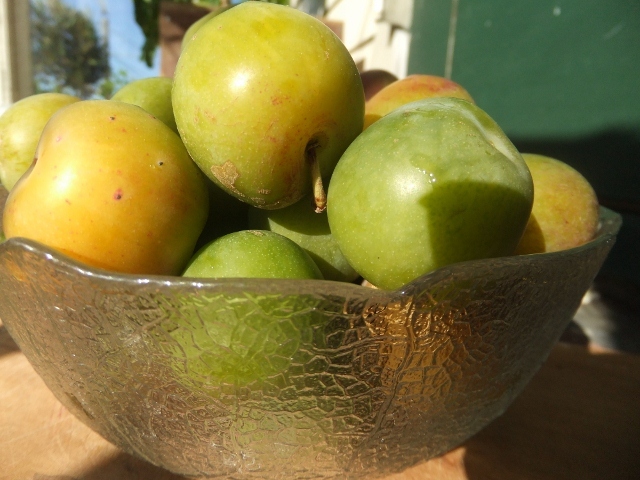 Something as simple as a greengage plum, a little green orb, is perhaps insignificant to some. 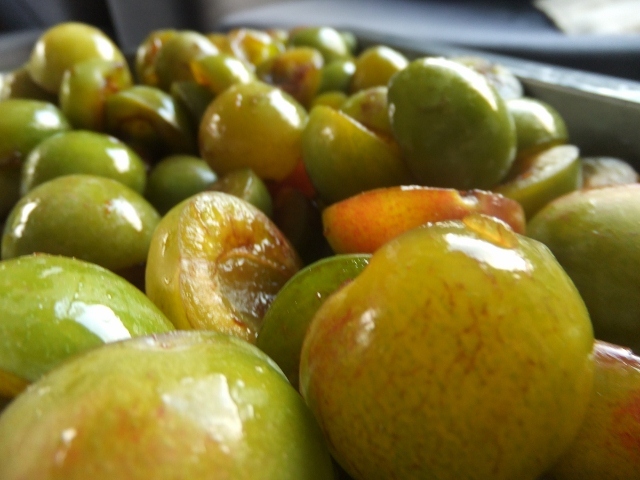 But right now, ingredients like the greengage are new and interesting. They re-direct my focus to broader issues such as provenance, seasonality and the efforts of the growers. 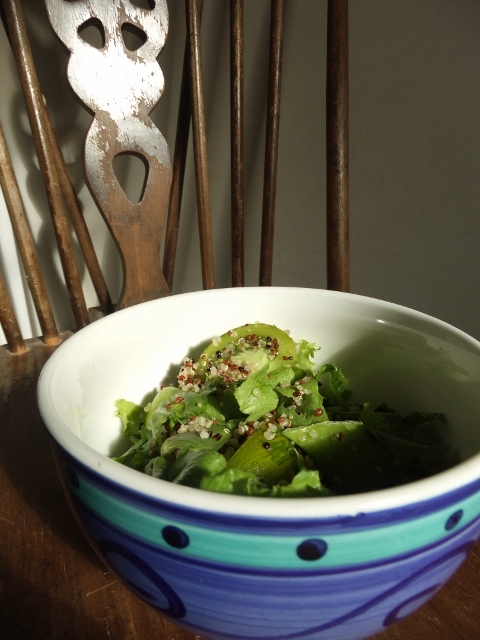 A bowl of greengages on my kitchen table is something of an inspiration. Recipe adapted from the Martha Stewart site. 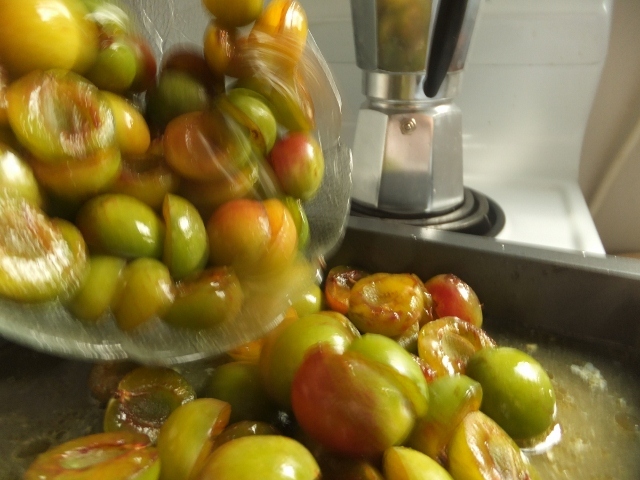 De-stoning the plums might seem like a hassle but is worth the effort. Get into a routine – slice, twist, tug out the stone. Preheat oven to 180°C. Place the butter in a roasting dish and put in the oven to melt. 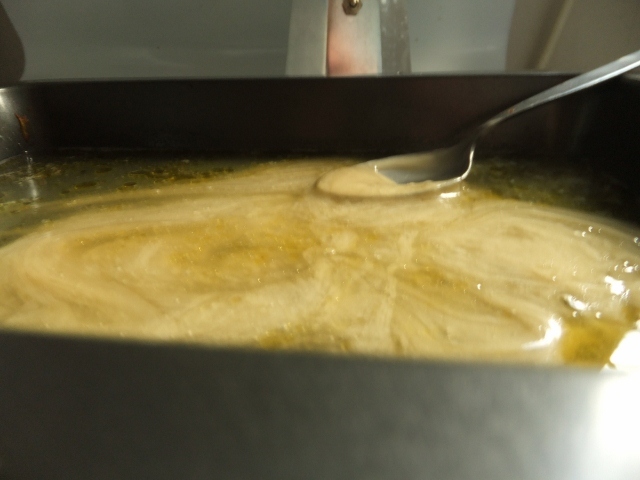 Add the honey and orange juice and stir until mixed – depending on the thickness of your honey you may have to place the syrup in the oven before stirring. 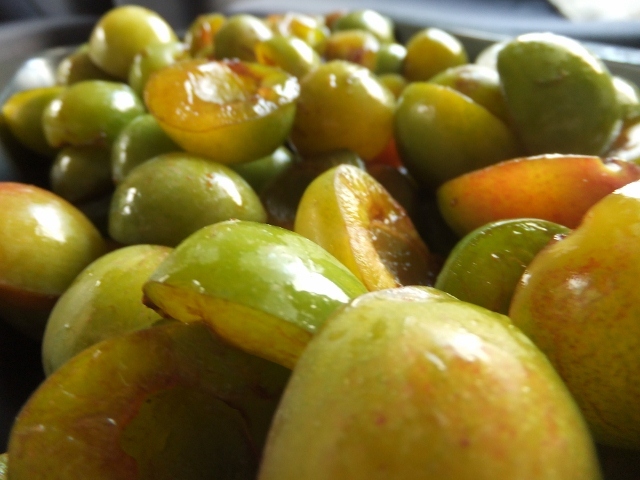 Add the cut and stoned greengages and carefully mix to cover in the syrup. Roast for 30-40 minutes until beginning to fall apart. Serve with yoghurt, cream or as a thick compote atop a buttery cake. The plums will keep for up to a week in the fridge but it pays to reheat before serving so the butter in the syrup melts. About a year ago we planted our first garden at the flat. 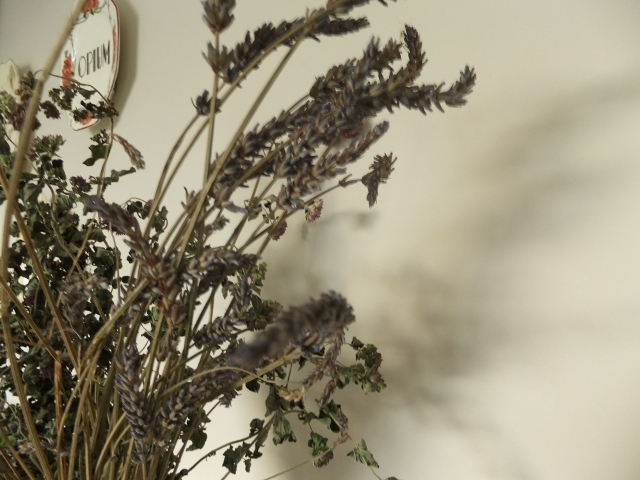 Previously our garden had looked like an ecological war zone, but to plant vegetables, herbs and flowers was doing something good – a small give back to the land. We grew beetroot, celery, spinach and picked stems of oregano, parsley, coriander, thyme and rosemary for our cooking. Then the winter came and while the plants withered and were overrun by weeds, we grew lazy. Spring came. The quarterly change of seasons, such a reliable stake in the ground as each year fills up and tumbles by. Perrin and I got to work on one of the first warm days of the season. I tugged and ripped up weed clogged earth, sacrificing the skin of my hands and arms, while Perrin built a planter box from salvaged wood. We tilled and fertilised, watered and planned what to grow. Now, a few months later, most of my garden is flourishing. 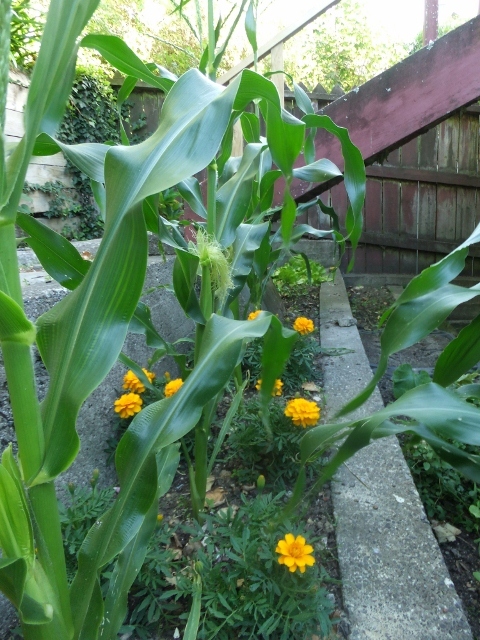 I planted sweet corn, tall and with leaves that wave gently. Silk is beginning to sprout from the small bulges along the stalk; soon they will be ready. Spinach thrived here last year, and now if you look down from the balcony you’ll see two small square plots; one with dark forest green spinach and the other a hard wearing rosemary plant. Spanakopita will be on the menu soon. 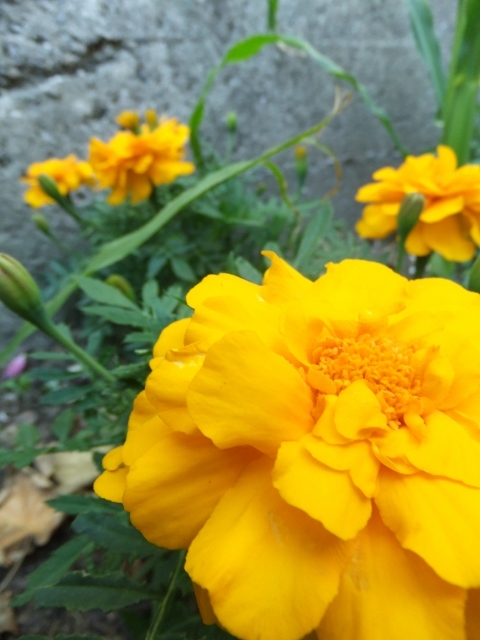 Between the corn plants on one garden terrace, bright orange marigolds beckon the bees. The flower heads are nearly the size of my palm and new buds, long and slender like bullets, wait patiently their turn. 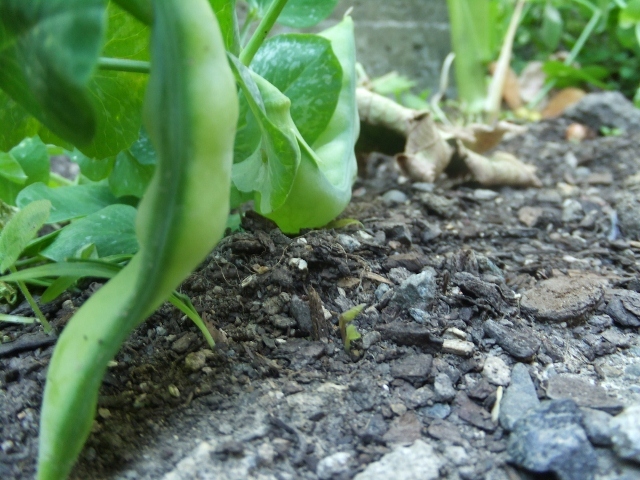 Between the corn on the next garden terrace are two snow pea plants. Their curling tendrils grasp each other and the nearby oregano plant which oddly prospered beneath the canopy of winter weeds. The tomato plant, though, I am most proud of. It sits in all its bushy beauty in the planter box on my balcony. The balcony has glass sides creating a greenhouse effect, and sometimes I stand out there just to smell the grassy, peppery, fresh scent. 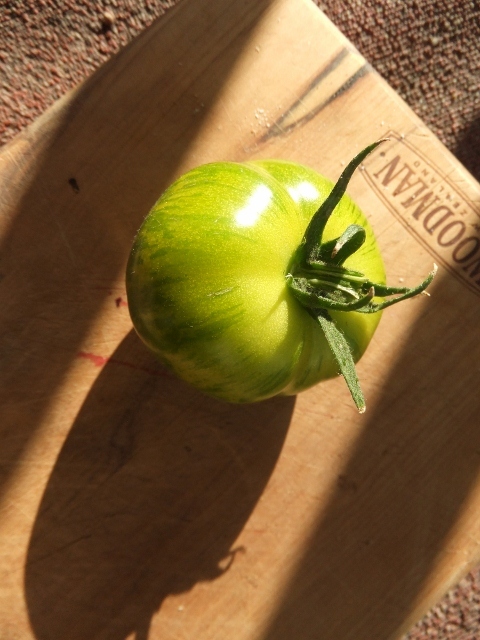 I chose a green zebra tomato plant, a move away from the all too common red. I would love to see purple, black, striped and green tomatoes grace our market stalls, but until that day I might have to grow them myself. 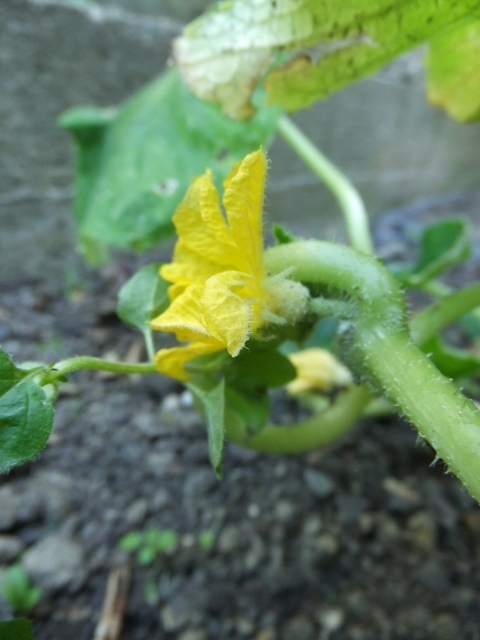 I have a strange affinity for the green zebra tomato plant, which is particularly strange when you consider that before last night I had never actually eaten one. 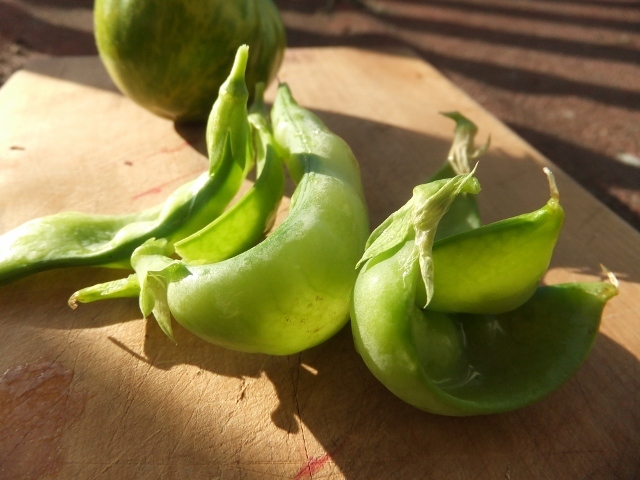 During my last month in France when I lived and worked with the woman who ran a market garden we planted close to 200 green zebra tomato plants. It wasn’t until after we had carried them from the greenhouse to the truck, from the truck to the garden, positioned them along the rows, dug 200 holes and placed every last green zebra tomato plant, tucking the soil around their stems, that I realised green zebra, or grinzibra as I had heard it in thick French accents, were English words denoting their pale and dark green stripes. Jokes on me, kids. Last night, a Saturday night, but any other night by my standards, a little harvest took place in my garden. I delicately snipped five fully grown snow peas above their pixie edged caps. I pulled whole lettuces from the planter box and peeled away their outer leaves to reveal the young shoots within, each one with a spine intricately curled upon the other. 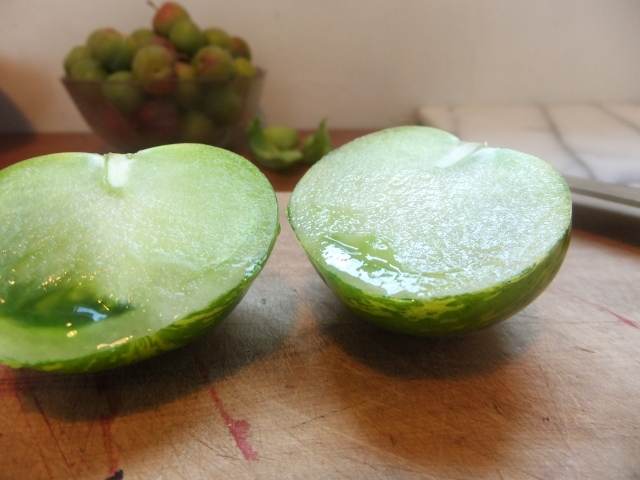 My one green tomato, soft yet firm to the touch, was sliced into eighths, each piece holding tiny green seeds. I bought a bag of green beans, vaguely prickly to touch, but with snap and crunch. Fresh beans have piz-zaz and oomph. 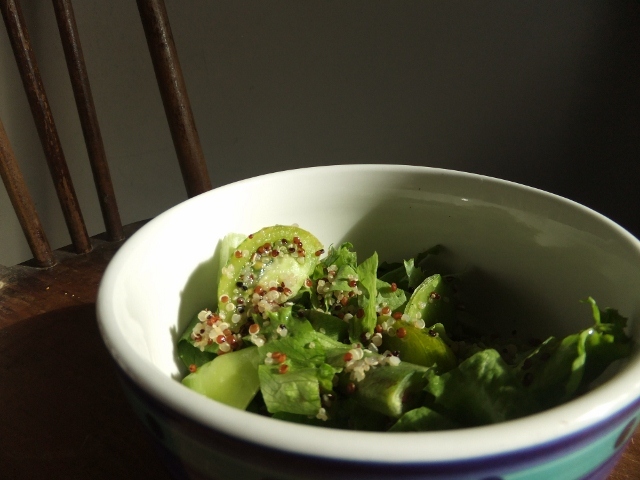 Next a cup of cooked quinoa, lemon zest and half a diced pear for sweetness. A strange combination, perhaps, but there was such a sense of satisfaction in its varied greenery, in the sweet earthy flavours and knowing the goodness of the ingredients. 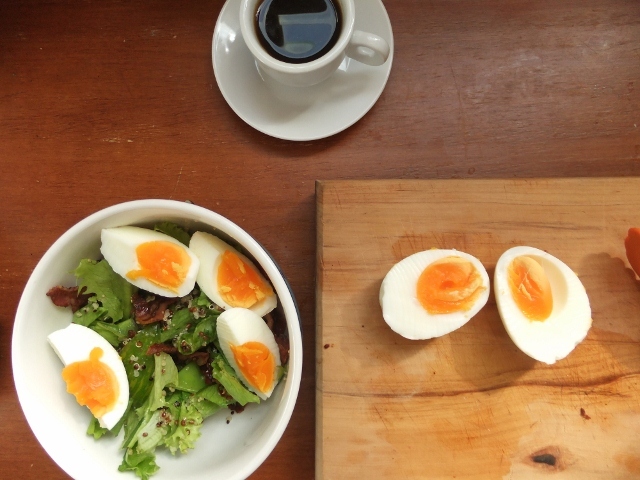 The next morning, a perfect hard-boiled egg and a few rashers of bacon and there was a breakfast salad. My parents spent much of my childhood tending to their garden and I never really understood the appeal. But now, this summer, I fancy myself a grower, a cultivator, a green fingered girl. I dream of self sustainability, revel in seeing a worm weave its way through my soil and continue to marvel at the power of the elements in creating, or destroying, a garden. After Christmas Perrin brought me a bag of plums from his sister’s tree. He called to tell me he had picked a handful to make a cake. I remember smiling down the phone at this guy who picks me plums and suggests cake making. 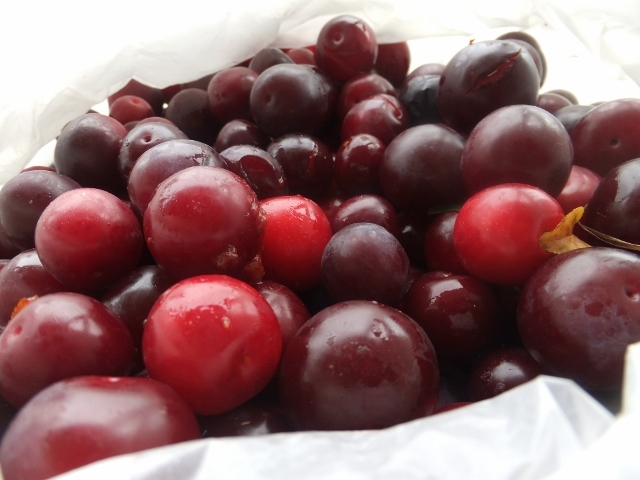 He brought the plums back in a supermarket shopping bag, the plastic threatening to tear. Nearly three kilos of small cherry-like fruit with dark skins and flesh the colour of a ruby sunset. The ripe skins were beginning to burst. We got to work fast. 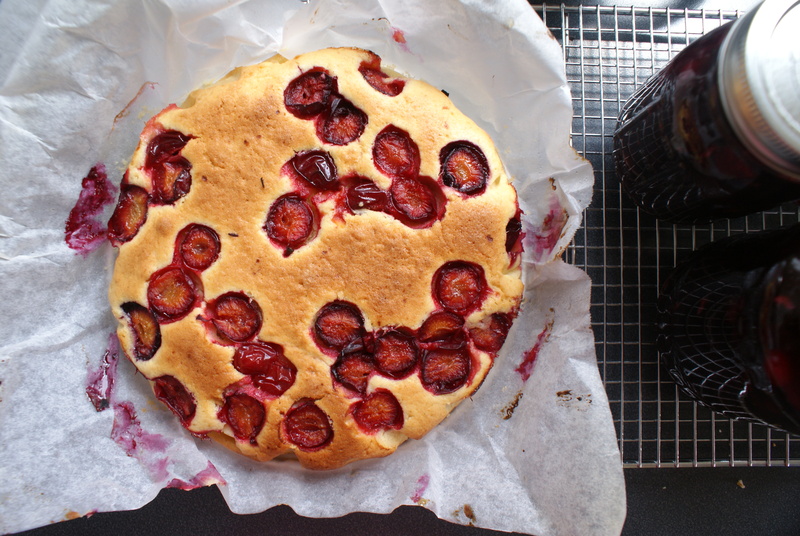 This french plum cake recipe comes from an old Annabel Langbein book, the font and photos harking back to the nineties. It has been years since we have made this cake, maybe not so long ago as the nineties but I had forgotten the exciting bite of a plum cake – the soft buttery crumb with tart lush plums, their juices bursting, running red through the pale batter with the pierce of a fork. Normally the plums sink as the cake cooks and the batter envelops the dimple of the cut half, but our plums were too small, light enough to gently nestle into the top of the cake. 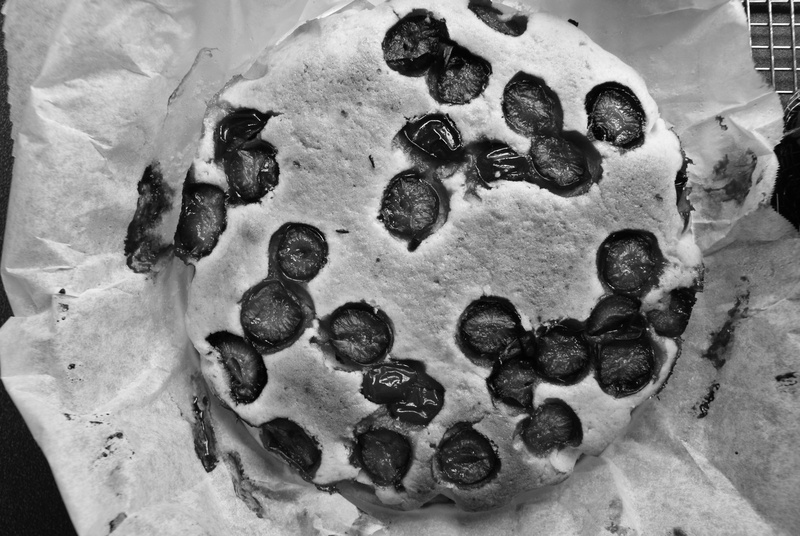 It was a polka dot cake and, when you think about, there is a happy simplicity to polka dots whether on a dress, around the lip of a bowl or spotted across the surface of a cake. 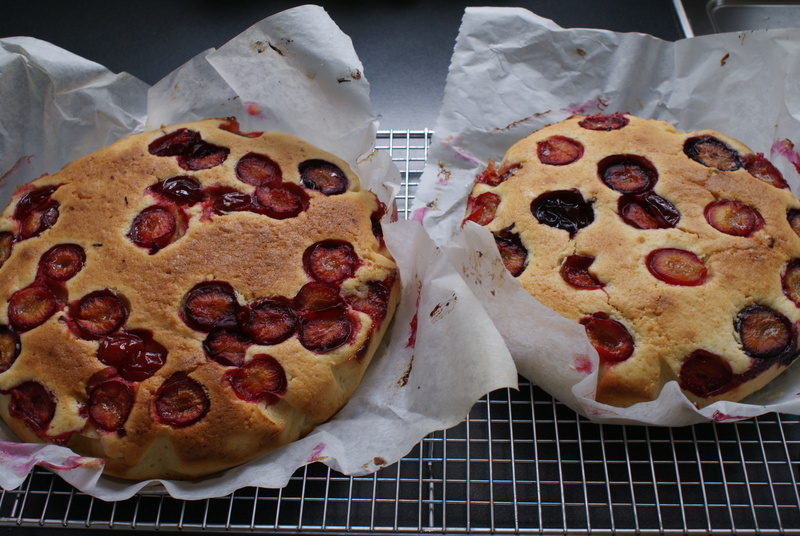 A few years ago, for a creative writing course, I wrote a story about making plum and apricot cakes. The story, the way it read, was largely fiction but the memories it conjured for me were true. My mother, sister and I picked the fruit from our elderly, dying neighbour’s tree. I wrote of standing on vinyl covered chairs at the kitchen bench with tea towels tied around our necks pulling the stones from the halved fruit with our fingers. 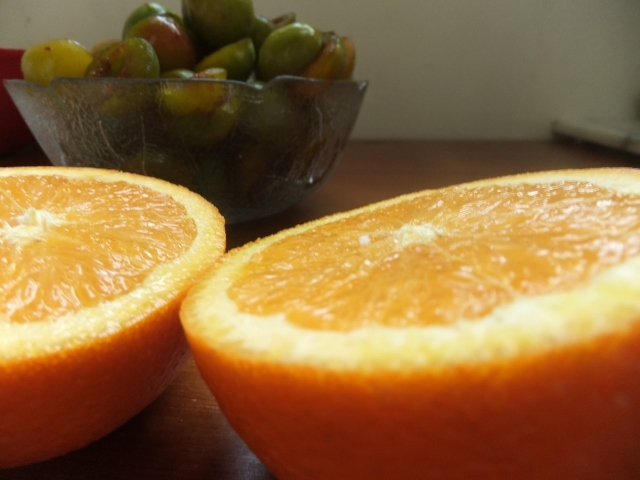 The fruit in the story was over-ripe too, nearly stewing in their ripeness, I wrote. It was summer time in the story and ripening stone fruit – the scent, soft fruit in hand, juices seeping from torn skin – then and now, create a sense of urgency; these need to be used, no waste. There were associations made between the fragility of a life of a plum and that of a person. Perhaps a more straightforward theme of my story was the simple pleasures cake baking can bring to both the cook and the recipient. These feelings are only heightened when the plums have been hand-picked off a neighbour’s or a sister’s tree. This recipe, from Annabel Langbein‘s book More Taste than Time, makes two cakes; one to keep, one to give away. Pre-heat oven to 180°C. 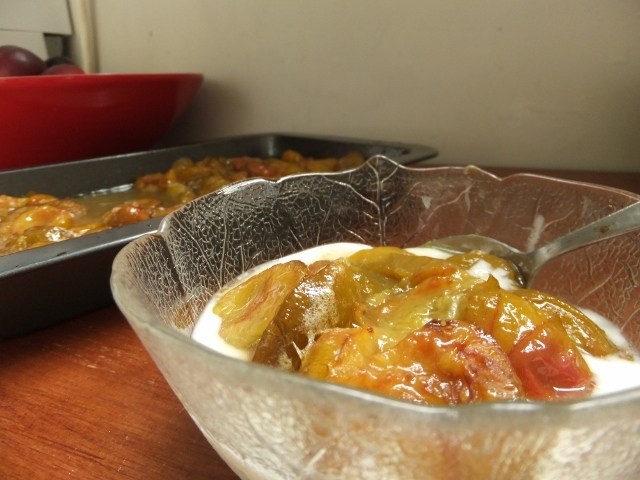 Slice plums into a bowl and sprinkle with the 3 tablespoons of sugar. (If plums are small like ours slice in half, but quarter if using bigger plums.) 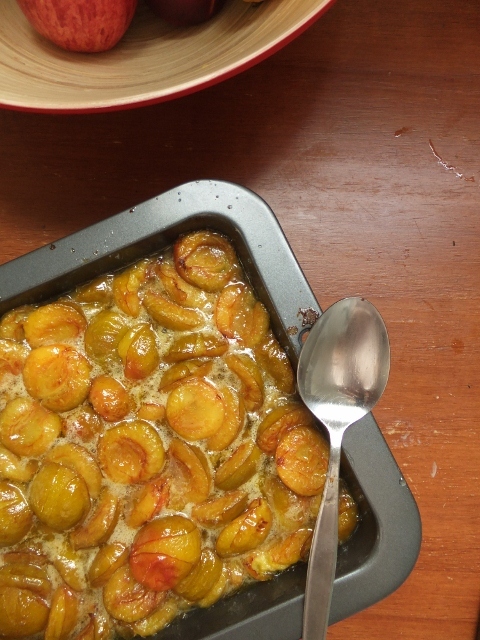 Toss plums and leave to sit while preparing the rest of the cake. Cream together the butter and the sugar. Add eggs, lemon rind, vanilla essence then stir in the milk, flour and baking powder. 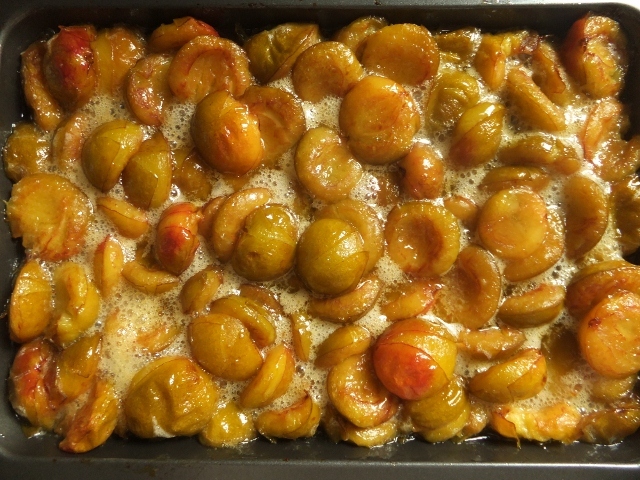 Divide batter between two tins and arrange plums on top. Cook for 60-65 minutes – the fruit will sink into the cake as it cooks. Serve warm with yoghurt or whipped cream. Best eaten the day of making – the second cake can be frozen.